Turmeric Latte has a delightful "sunny" yellow colour and wonderfully milky-sweet flavour with a slightly bitter finish. The sweet scents of vanilla and cinnamon blend together to create a wonderful smell. What a treat! 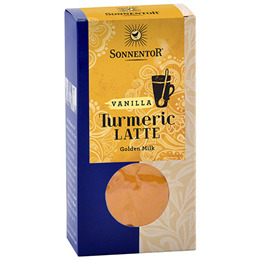 This product is a refill for the Sonnentor Organic Turmeric Latte Tin - Vanilla. 100% organic: turmeric 54%, cinnamon Ceylon, cocoa, ginger, vanilla 5%, liqourice, pepper black. Below are reviews of Sonnentor Organic Turmeric Latte Refill - Vanilla - 60g by bodykind customers. If you have tried this product we'd love to hear what you think so please leave a review. Love it and nice to be able to order refills!